A reminder for myself, we are asking to take a path of being nothing. That if not for the Rahma (mercy) of Allah (Azza wa Jal) then we are non-existent. From the way of the Turuq, it is a school of adab. That we are not coming to show how much Qur’an we have memorized or how many Hadith we have memorized but these are the schools of adab and they teach us on how to have ma’rifah and how to have good character so that Allah (Azza wa Jal)’s rida (satisfaction) dresses us, and Prophet (sallallahu alayhi wa sallam)’s rida dresses us, Awliyaullah’s rida dress us and we should find success in our life in dunya, and most importantly in Akhirah. Is your Shahada (Testimony of Faith) Real? A reminder for ourselves that from these schools of akhlaaq, they are teaching us that before we think how big we are or how much we memorized or how much we have prayed, if you just come to your Shahada: ashadu an laa ilaha ilAllah wa ashadu ana Muhammadan abduhu wa Habeebuhu wa Rasuluh, you don’t see it. So your Shahada is not correct, it is an imitated Shahada. I bear witness that Muhammad ﷺ is the messenger of Allah. So before we have to go into too much `uloom (knowledges) and trying to prove who is who and who is what, go back and always remember: Yaa Rabbi my Shahada is not real because I am not witnessing You, and I am not witnessing Sayyidina Muhammad (sallallahu alayhi wa sallam). Because Prophet (sallallahu alayhi wa sallam) described Maqaam al-Ihsan: to pray as if you see Allah (Azza wa Jal). There are people, who through their heart, they can pray with what Allah (Azza wa Jal) wants them to see, they see it. There are many from Saliheen and Awliyaullah who in their salah see Prophet (sallallahu alayhi wa sallam). And they say, “Assalaamu `alayka yaa ayyuhan Nabi,” [Peace be upon you O Prophet (saws)] (sallallahu alayhi wa sallam) in present, then Prophet (sallallahu alayhi wa sallam) must be facing them, not the back of Prophet (sallallahu alayhi wa sallam), but the wajhu kal kareem, the holy face of Prophet (sallallahu alayhi wa sallam) must be facing them. They give this as an understanding that this is our goal: to reach to Maqaam al-Ihsan (Station of Excellence). And to make our Islam to be real, because if that Shahada becomes real then next is the salah. The salah becomes real. Then the zakat is that they sacrifice themselves entirely and they become Mukhlis, their whole life is to live a life of sacrifice. And their Ramadan is fasting through all of their senses. Ittaqullah, Allah (Azza wa Jal) is describing these Muttaqeen that they are completely in submission. It means this is the goal! Then we come into our own lives and they remind us that with all the naat shareef and crying because we are the people of love, Ahlul Muhabbat, so alhamdulillah we are almost halfway there. Because there are many people who don’t have the love and their practice and their `amal (action) is not based on love and muhabbat. Alhamdulillah that it is the way of muhabbat that we are making the naat shareef, we are making the darood shareef [praising upon prophet (saws)] we are making the mehfil, we are doing the Zikr. Then they are reminding us that with all that we are doing, it is not entering into the heart so that we can reach to the maqaams (stations) of sincerity. That is what is important in our lives, that with all that we are doing and reciting and crying [mic disturbance, and they want to fix it. Shaykh explains about that] (Don’t worry, it will be a distraction. Because in everything Shaytan comes to make a distraction and make everything upside down. Then this of what is coming of information will be cut..] It means that everything that we are doing is to reach that goal. It is important for us that they give the goal. 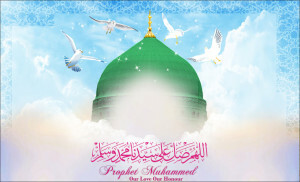 That we are trying to reach to see Prophet (s) to make our Islam to be real and to reach to Maqaamul Ihsaan. If we are not reaching there, there is something wrong in the `amal (action) that we are doing. When we are crying for naat shareef, and crying for the mehfil means that love is there. But what is it in the character that is not opening sincerity? It means these are the people of tafakkur, and contemplation. If I want to know my Lord I have to know myself. I have to sit on a nightly basis and make tafakkur, contemplate with my heart and in that tafakkur make a muhasabah (take an account). That every night, the way they taught us is that every night you make a tafakkur: that yaa Rabbi I want to reach and I am not reaching, my Shahada is not real, my salah is not real, my zakat is not real. It is all by the Rahma (mercy) of Allah (Azza wa Jal) that He keeps us going because we are not yet Rijaalallah (men of God). Rijaalallah, Allah granted their ‘amal (action) to be real. If we didn’t reach to that, every night we should be in tafakkur and contemplation. Then they remind us: yaa Rabbi when I am making tafakkur what am I doing wrong? Who did I harm today? Who did I aggravate today? Who did I hurt with my tongue and I affected their heart? All of that would be an account that blocks the heart of the believer. If we don’t take a nightly muhasabah, then we are wasting our time with all the ‘amal that we are doing, because you are going one step forward but ten steps back. Means you do all these actions of love, all these practices of love, but all day long we are hurting people with our hands, with our actions, with our tongue and we are doing things that maybe Allah is not pleased with, Prophet (sallallahu alayhi wa sallam) is not pleased with, Awliyaullah are not pleased with. And we find no growth in our lives; we find nothing is growing, nothing is blossoming. And most of all your rizq will come short, your hand becomes short to what Allah (Azza wa Jal) wants to give. Because when Allah (Azza wa Jal) has Rida and is satisfied, He is dressing upon the soul. Allah (‘Azza wa jal)’s Rids dresses the soul, and the rizq hits the soul, means the lights, beatific lights, and the knowledge, and angelic power dress the soul. When the soul is abundantly dressed, the rizq of the physical body is overflowing. Means when you run after dunya, dunya is running away from you, but when you are running towards Mawla to Allah (Azza wa Jal) dunya is chasing after you. 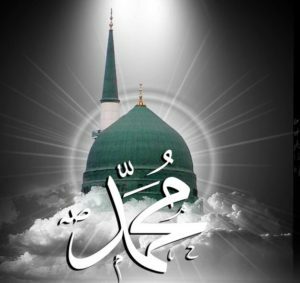 They begin to re-calibrate the compass; that if these things I am meeting this criteria, where my Shahada is not real, I have love for Prophet (sallallahu alayhi wa sallam) but why am I not seeing Prophet (sallallahu alayhi wa sallam)? Is he hiding from me? He is right there in front of me. All my salah, [we say] as-salaamu ‘alayka ayyuhan Nabi, but why is my ‘amal not good enough and Allah (Azza wa Jal) didn’t grant enough sincerity for this veil to be lifted? They begin to teach from these characters that when you take a muhasaba and accounting of yourself, everything will come under that account. Allah (Azza wa Jal) many times inspired Awliyaullah to look at my nature, and do not look at humans. Human beings have a big head and big ego, look at the nature. One famous one was Jalaluddin Rumi (qadas allahu sirrahu). He was looking and making tafakkur and we have many naats and poetry about tafakkur. Rumi was making tafakkur and put a flame because they used a candle. The barakah of the candle is that; as soon as you light a candle for ‘ibadah (worship), there are Malayikah (angels) attached to that candle. As long as that light is lit, they are praising on our behalf to the Divinely Presence. So when they would read Qur’an or read darood they would light the candle. So he lit the candle and he was looking at the flame and was mesmerized by the candle. 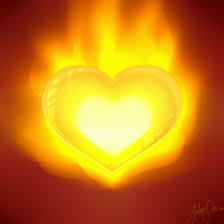 That this fire is the fire of `Ashiqeen, this fire is the condition of his heart. 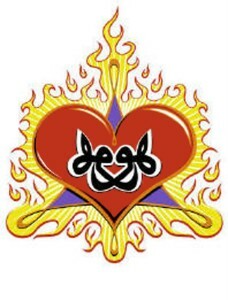 If my heart is not lit and I am not feeling the love for Prophet (sallallahu alayhi wa sallam), not feeling the love for Allah (Azza wa Jal) then it is a dead heart. He was looking at the candle and he was lost in the understanding of being in ‘ishq, to be in love with the Divinely Presence and what he sees is the moth. 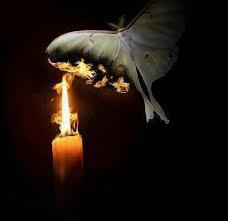 The moth comes and it goes right into the fire. If you can’t handle the fire, Stay raw! That this one was bad to me, I am not talking to him any more. Who are you? Are you Fir’aun? Allah didn’t care about you. A Mukhlis (says) samina wa ata’na, yaa Rabbi You want that one, I am of service, you don’t want that one, I am of service. They live their whole life with that understanding: it is not about what I want, it is not about what my desire is. It is my desire, my want, that is blocking everything from ikhlas (sincerity). He was looking at the flame and the moth went like a bomber right into that flame, not thinking anything of itself and it completely burns. Who can do that? Who can copy just one example of Allah’s creatures? Then he said, “Subhaanallah yaa Rabbi what coordinance you gave to this moth? How it sacrificed itself for Your love!” Why does the moth go to the flame? Have you seen the bugs outside? When you put candles, back home all the bugs go straight into the fire. Because they remember this fire, they see this is the fire of ‘ishq, of Divinely Presence and they don’t think anything going into that fire. For us it is reminder that every time when you have that mushkilat (difficulties) in your life, it is not about you coming and making everything comfortable, everything payable, everybody in love and happiness and in romance. Allah is saying: you just copy, not all the Rasuls (Messengers), not all the Sahaba (Companions of prophet (saws)), all these buzurgan (elders/pious people), copy My moth. What do you call the moth [in Urdu]? [Parwana] We say butterflies are parvaneh. Copy one of these parvana and I will be so happy with you.Means every time you hit the flame and every body knows when they have a fire, when things are coming short and you feel difficulty, means yaa Rabbi let it to go. Why is Allah ing you? Because He wants to burn everything other than His love. Everything else has to go! Put aside your clever schemes! O Lover, be mindless! Become mad! 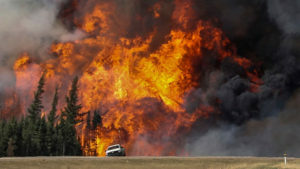 We just saw a big fire [in Fort McMurry, Edmonton, AB Canada], 70,000 [people evacuated], sayhatan wahidatan means that in one moment Allah (Azza wa Jal) gave a command and an entire city was taken out by that fire. Allah (Azza wa Jal) is giving us so many different examples that: when I don’t want something, I don’t want it in you. The understanding of jahannam is what? Everybody has to go through the Fire. Why? Because all that exists other than Allah (Azza wa Jal) is going to be burnt! All this garbage you are bringing with you of your nafs, your desire, your money and all the things you want, you have attached them to yourself. In My Kingdom none of that can come. First go through the firewall. We have computers so Allah (Azza wa Jal) is again teaching us through our computers. That everybody who has worked on computers, they have a firewall. Why? They are not going to let that virus inside. If Allah is teaching you through the computer that your virus cannot get into that computer because it will shut it down, then how am I going to let your virus enter into My Paradises? Allah (Azza wa Jal) says: I gave you half way, I gave you love to seek out Prophet (salallahu alayhi wa sallam) and I am going to love you. When I love you, I am very jealous when I look at your heart, I don’t want to see a woman in your heart, I don’t want to see your Mercedes in your heart, I don’t want to see your bank account in your heart. I don’t want to see your ananiyya that you pick and chose based on who has been nice to you and who has been bad to you. You be a servant of Mine and whoever did whatever they did for you or did to you, it is none of your business. I am your Lord, I am the one who sustains you and you are My servant, and you merely serve Allah (Azza wa Jal). These are the Mukhlis. They don’t put their opinion in anything. Allah loves one and they dispatch them and they send the Message. Allah doesn’t love that one, they have nothing to do with it, but they don’t put themselves in the middle of that scenario. In everything in our lives they want us to take a tafakkur that try to reach a level where we willingly burn all the excess baggage. When Allah (Azza wa Jal) is showing the fire is very near, in one moment another fire comes. In one moment another catastrophe comes, in one moment an earthquake comes, a tsunami comes, and everything will be taken away. And at that moment you will be in the presence of Allah (Azza wa Jal) with only your character. He (saws) was not beating or cursing the people or making tribal disputes. Prophet ﷺ broke all the barriers. He (saws) loved everyone, he tried to bring everyone to the love of Allah (Azza wa Jal). 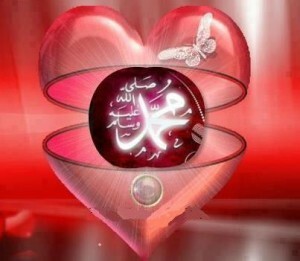 Prophet (sallalahu alayhi wa sallam) is then teaching: if you are going to be my ambassador for `ishq, for love. That you fight only yourself, you come only against yourself, and the only enemy you should have is yourself. And every night you are sitting in tafakkur and crying, yaa Rabbi this self is like a zombie, it is not going anywhere. And every night I look at myself and realize that I did everything wrong that day, I am loving everything other than You. How Many People Move for Money but not For Allah (aj)? How many people made a hijrah into this region (West) with the intention for money and not for Allah and His Rasul? You moved away from Allah and His Rasul. The intention was for money. What did Allah show you with that? In one day, eight hours that intention was burnt [Wildfire in Fort McMurry, Edmonton, AB Canada 2016]. Now you look back and there is nothing there. This is a sign. There are a tremendous amount of believers in this area and Allah (Azza wa Jal) loves them. Allah (Azza wa Jal) is warning us: that if you are loving dunya, this dunya is going; if you’re happy with your bad character, you are going to see difficulty in the grave. But if it is Me that you love and Sayyidina Muhammad (saws) that you love, then take a nightly accounting, take a muhasabah that: yaa Rabbi what am I living for? Am I living for money and my day to day pay? Money is everywhere but I should be living a life in which I am serving. Serving Allah (Azza wa Jal) through His Beloved Sayyidna Muhammad (sallallahu alayhi wa sallam), of khidmat Nabi al-Kareem means that do whatever you can do for the love of Prophet (sallallahu alayhi wa sallam). 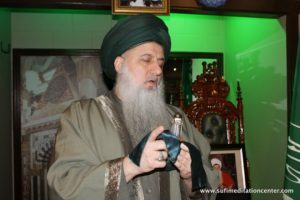 You travel great distances [to come for Zikr and see Mawlana Shaykh Nurjan] for the love of Sayyidina Muhammad (sallallahu alayhi wa sallam), why? So that maybe Prophet (sallallahu alayhi wa sallam)’s nazar will be upon you and that Prophet (sallallahu alayhi wa sallam) is happy with you and take mushkilat and difficulty away from you. I pray always for myself and a reminder for myself that difficulty is all around us, don’t be so quick to think that we have to throw it off and get it prayed off, but to find the hikmat and the wisdom. 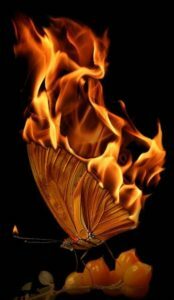 That if a moth goes into the fire and completely surrenders itself for the love of Allah (Azza wa Jal), Oh, we are `Ashiqeen of Sayyidina Muhammad (sallallahu alayhi wa sallam), at least we can put the wing near the flame to get a little bit (of burning) and say, “Okay the difficulty is making my life a little bit sweeter.” When you have difficulty you cry unto Allah (Azza wa Jal), when you have difficulty you cry unto Prophet (sallallahu alayhi wa sallam): yaa Sayyidi yaa Rasulul Kareem, take my case to Allah (Azza wa Jal). That is dear to them but why do you have to be in difficulty to achieve that? You can achieve that every night, yaa Rabbi I don’t need difficulty, I love you so much, I am trying to change my character, I am going to beat myself down, every time somebody offends me, I am going to go with more love to them. Every time they insult my character I am going to go with more love for them. I am going to scrub myself, I don’t need You to scrub me. Subhaana rabbika rabbil `izzati `amma yasifoon wa salaamun `alal mursaleen wal hamdulillahi rabbil `aalameen.